HIJACK > Food for your Ears > The Desk > Music production Seminar with Krust, Culprate, Mefjus and More!! 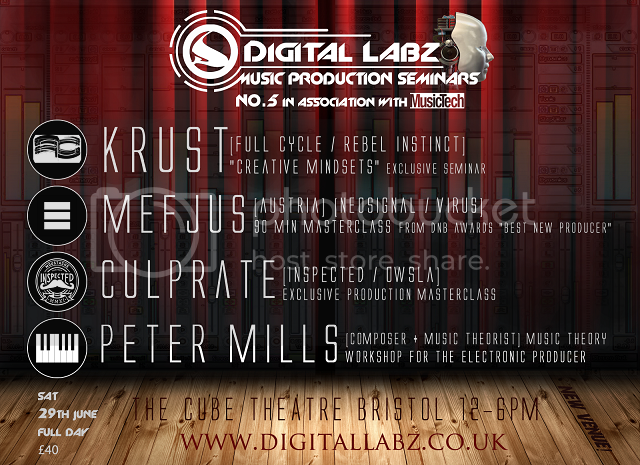 Music production Seminar with Krust, Culprate, Mefjus and More!! Keen to improve the quality of your music? We're back again with another massive day of talks, tutorials and cutting edge music production information to get your music sounding BIG. VIDEOS POLICY - As you may be aware up until now we have been filming the talks in full and making them available for download through our site. Due to the nature of the speakers we have at this event, releasing full length videos is not possible for all talks. This is done regrettably, but we have to respect their wiishes. Thanks for your understanding. CLICK LINK BELOW TO VIEW A VIDEO ABOUT THE EVENTS!! Re: Music production Seminar with Krust, Culprate, Mefjus and More!! Thank you for giving the information. I am eager to attend the seminar as I had recently finished my audio engineering course and I want to practice in this by attending different types of seminars. I have also composed and edited many music during my course duration. I have also mixed various types of music. Wicked! yes these are great places to pick up information not taught in institutions... still a few seats left! As long as the 'book here' link is up on the site there is space.